Posted on 7, January 2016 by EuropaWire PR Editors | This entry was posted in Germany, Healthcare, Science, Technology and tagged Dr. Christian Schmidt, Dr. Joachim Storsberg, Fraunhofer Institute for Applied Polymer Research, IAP, polymer-based rapid test, visually differentiates tumor cells from healthy cells. Bookmark the permalink. POTSDAM-GOLM, 7-1-2016 — /EuropaWire/ — The tumor glows brightly on the bluish fluorescent MRI image. The ulcer is localized. With this information, the surgeon gets to work. Now, he has to rely on his eyes. The skill lies in not cutting away too much while still completely removing the diseased tissue. “Locating tumors accurately in tissue sections is not easy. It’s easy to distinguish diseased from healthy tissue at the core of the cancerous ulcer, but not around the edges: tumors spread out asymmetrically,” says Dr. Joachim Storsberg of the Fraunhofer Institute for Applied Polymer Research IAP in Potsdam-Golm. During surgery, a specially-trained professional, the histologist, examines the excised tissue samples with high-resolution microscopes. He identifies characteristic structures of cancer cells and informs the surgeon of whether or not there are any ulcers. This can take several days. The IAP has developed a polymer-based rapid test which visually differentiates tumor cells from healthy cells in a tissue section through the use of a simple microscope. Surgeons can already use the test in the operating room. This saves time and costs. “Studies have shown that receptors sit on tumor cells, and certain specially-bred antibodies attach to these receptors: for example, estrogen antibodies on breast carcinomas. Using this “immunodiagnostic” method, the surgeon only needs a few minutes to make sure that all the diseased tissue has been removed,” Storsberg says, explaining the added value of the new tests. “Once placed on the tissue sample, the antibodies search independently for their counterpart – the receptors which are typical for them”. After the surgeon has placed the antibody on the tissue sample, a colored water solution is added, with which the individual enzymes of the antibody oxidize. The color of the solution changes: the tissue sites at which this happens contain diseased tissue. “The test is quite versatile: different antibodies can be used or combined depending on the type of tumor,” explains Dr. Storsberg’s colleague, Dr. Christian Schmidt. For reasons of reliability, a cross test characteristically dyes the healthy cells in the next step. Once neither of the two tests detect any more tumor cells, the surgeon can conclude the operation: he has cut out all of the diseased cells. The scientists are working to make the color contrasts between healthy and diseased tissue cells more clearly visible. This work will be promoted in the Central Innovation Program for SMEs (in German, the Zentralen Innovationsprogramm Mittelstand – ZIM) by the German Federal Ministry for Economic Affairs and Energy. According to the German Federal Statistical Office, 25 percent of all the people who died in Germany in 2013 succumbed to cancer. With more than 223,000 deaths, tumors are the second leading cause of death after cardiovascular diseases. The disease costs the European Union (EU) a total of 126 billion euros in 2009. That was determined by scientists at the University of Oxford and King’s College London in 2013. 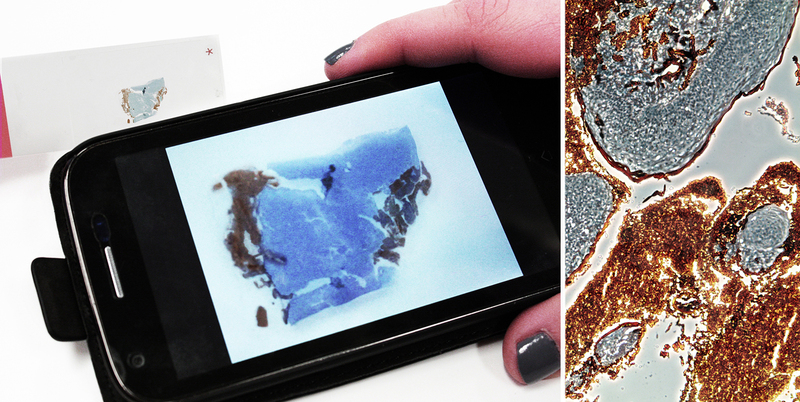 Even a cell phone camera is sufficient to examine tissue samples for tumor cells.